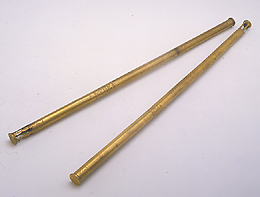 These two supports are each made up of three tubular gilt brass sections, which have small covers. The instruments are finely wrought and decorated, and were used in mining. Like the boxes and other accessories, they were brought from Germany by Prince Mattias de' Medici in 1635.